I’ve fished at Rose River Farms several times now and it consistently produces large trout in a relaxing atmosphere. Even in the dead of winter, the fish are plentiful and hungry and I always return home with a renewed confidence about my ability to catch big fish. It’s amazing to think how close it is to the hustle bustle of Northern Virginia. 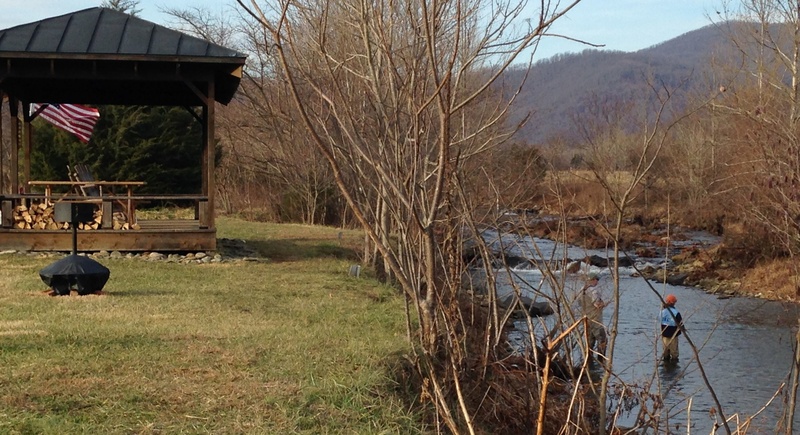 This winter, my family and I decided to stay at the Rose River Farm yurts. I had driven by these unique structures many times on my way to fish the farm, and I always wondered what they were like inside. So, we reserved two nights at the Hill Top yurt the weekend before Christmas. Fortunately for us, there was a break in the wet, cold wintery days. We arrived Friday evening and the temperature was in the 60s. The directions to the yurts were straightforward. Even though I was worried we’d miss the sign in the darkness, it was easy to find. We pulled up to the Hill Top yurt and mused at the panorama of stars above us and deep blue mountains across the valley. As we entered the yurt, we found the setup to be exceptional — clean rooms, beddings and bathrooms, and a fully stocked kitchen. The family room had a large comfy leather sofa and a satellite-rigged flat panel TV. As expected, everything was decked out with a tasteful fishing theme, and there was an abundance of natural light thanks to the sky light at the pinnacle of the circular ceiling and the large windows projecting the beautiful mountain view. My wife really appreciated the cleanliness and attention to detail. After settling in, we set out to start a fire. Everything was just where you’d expect it — matches, pre-cut wood, a fire poker and cement-lined fire pit. This was the nicest setup I’d ever seen on a fishing trip. Soon enough, the whole family was roasting marshmallows, watching flaming embers, and dodging smoke as the fire became the central entertainment for the evening. The next morning, I woke early and set out to tie some flies for the trip to the farm. The fly tying bench in the yurt had a top-of-the-line vice (way better than mine), so I was able to knock out 4 Wolly Buggers and 6 San Juan Worms before the family woke up. I taught my 9 year-old son how to tie 2 San Juan Worms. The great thing about Rose River Farm is that it’s right in the middle of some of the best hikes and trout fishing spots in the Shenandoah. We decided to hike White Oak Canyon since we hadn’t been there since the 90s. So, we drove less than 15 minutes along beautiful country roads to the trailhead. The weather was spring-like as we hiked along the lower trail to the falls. Along the way, we stopped several times to enjoy the cascading waterway and the deep, clear pools. My son discovered how much he loved the outdoors. There was something to be found, made, or climbed around every bend. He made a sling-shot out of a branch, stacked rocks, and climbed up and slid down boulders. By the end of the hike, he was asking when we could go again. We picked up lunch off route 29 (10 miles or so from the yurts), then headed back to the farm for an afternoon of fly fishing. The first hole we fished, my son caught his first rainbow trout. I was so excited I nearly fell into the river. We fished several other spots upstream and lost one fish right as I reached for the net. After a few hours of fishing, we relaxed in the gazebo and watched others fish, then played football and tetherball in the field nearby. We couldn’t have picked a better time and place for a weekend vacation with the family. While many families may pass on the thought of going on a trip to a fishing cabin, the yurts at Rose River Farms are a family-friendly luxury. There are many nearby outdoor activities that don’t require a fishing rod. The peacefulness and the idyllic setting is a much needed reprieve for everyone. Rose River Farm is running a special on its cabins for the months of January and February– rent one night and your next night is free. All booking is done at their website www.RoseRiverFarm.com. Calling all striped bass chasers! If you are a regular here at the Lateral Line blog we you know we chase stripers in our backyard in the Chesapeake Bay and along the east coast Hunting these fish inspired us to design this t-shirt for our 2012 fall t shirt line for all striped bass chasers. Like the design and chase other fish? Don’t worry, we have a whole Fish Chaser line of short and long sleeve t-shirts rolling out in our new online store that we have under construction. Don’t want to wait to get this t shirt? No problem, we’ve leaked a few of the Fish Chaser series on the Tidal Fish Online Store, cruise over there and check them out. We’ll post a few the other designs next week. Have a good Labor Day weekend, get out there and catch some fish! While the Lateral Line HQ is in Maryland, we do a lot of fishing in Virginia. While we had heard about the boaters safety course requirement, we did not know exactly what it meant. We did some research and throught since we did it we would share it. Virginia enacted a law in 2007 that established requirements for boating safety education. A main component of that law was the requirement that all Virginia boaters would have to take a Virginia boating safety course, pass an exam, and hold a license verifying it. The law also required boaters from out of state to meet the same requirements unless they held a suitable license from another state or province. We always like to give a shout out to those that pick up the Lateral Line brand. Tidal Fish picked us up in their online fishing store and we found something in addition to their site worth giving a shout out. Their striped bass fishing t-shirt jumped out at us as pretty cool design. If you are into the saltwater inshore fishing scene and chase striped bass this t-shirt is worth a look. It comes in short sleeve and long sleeve. And while you are surfing their online store make sure you check out the hot new performance fishing t-shirt designs by Lateral Line. They have them up in their fishing shop before we do…. ouch that hurts man. Keep an eye out for them here on the Lateral Line soon.